Visit attractions like Love Park, Philadelphia Museum of Art, Please Touch Museum, Mutter Museum & more! Philadelphia can be safely termed as the United States’ most versatile city. It has played an important role in penning down the history of the United States and it still restores the picture of how American colonial cities used to look like. Soak up the city’s major highlights with the Philadelphia Hop-On, Hop-Off Tour . The tour gives you the chance to visit the top attractions of the city in a red double-decker bus. The Hop-On, Hop-Off bus covers 27 top attractions, covering the length and breadth of the city. Hop off the bus to discover an area and when you are done just hop back on the bus. While onboad informative audio-commentary will ensure you don’t miss a thing! Exchange your voucher at 111 S. Independence Mall East. Philadelphia, PA 19106. You may then board the bus at any of the stops. You may end the tour at any of the stops. 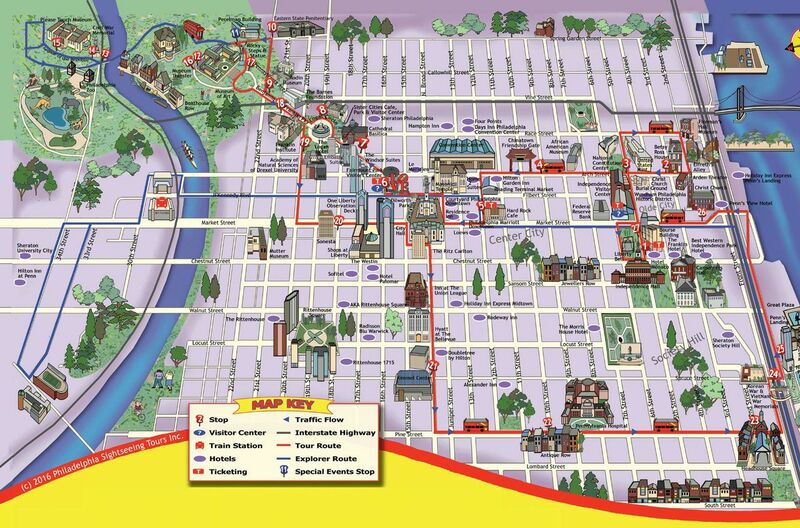 Hop on the bus at any of the stops to start your Philadelphia Sightseeing Hop-On, Hop-Off Tour. Plan your own sightseeing itinerary by hopping on and off at any of the designated stops, go sightseeing, and shop or eat and then hop back again when the next bus comes along. You can also simply sit back and relax for the entire 1 hour and 30 minutes loop as you are driven around the city in an open top, double-decker bus. While on the bus, you will discover Philadelphia’s rich history through our informative personal commentary and an onboard English-speaking guide. Choose between a 1, 2 or 3-day hop-on, hop-off ticket and explore Philadelphia at your own pace. With 27 stops covering the best of Philadelphia, visit Chinatown, Love Park, Rodin Museum and Betsy Ross House, the seamstress who sewed the first ever American flag. You can hop off at any of the stops to end your tour. This ticket is valid for the Red, City Sightseeing Buses. The buses have wheelchair access. Assistant dogs are allowed on board. The buses are centrally heated. You must exchange your voucher at 111 S. Independence Mall East. Philadelphia, PA 19106 before boarding the bus. While every attempt is made to provide a smooth service, from time to time, traffic and major events may cause disruption on the route and/or frequency of buses. The guide (Joey) was incredible! So fun and so much history. Philadelphia is a beautiful city! Very informative, interesting and entertaining!